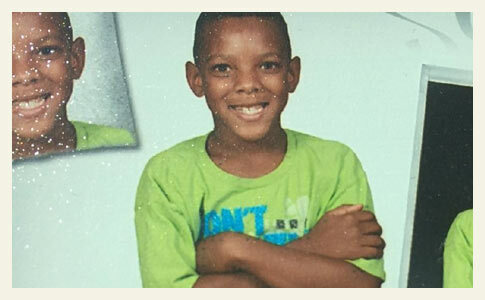 Derion Stevenson, 9-years old, was killed by a pit bull while visiting a friend's home. UPDATE 08/19/16: County authorities confirmed the pit bull that killed a 9-year old boy was also involved in dog fight in the same neighborhood in July. Clark County Animal Control did not declare the pit bull dangerous or vicious after the attack. Derion Stevenson died after the same pit bull brutally attacked his face and neck a month later. The lack of public safety concern given to "animal aggression" by many animal control authorities is abysmal in many jurisdictions. A neighbor was walking her labrador on July 11, when the pit bull, "Left Eye," attacked her dog, county spokesman Dan Kulin said. The pit bull's owner claimed the labrador initiated the fight. The labrador escaped serious injuries. In a statement released Friday, the county said, "the July incident was not serious enough to warrant a dangerous or vicious declaration." The victim dog would have to sustain "substantial bodily harm or die as a result" of the attack, the statement said. 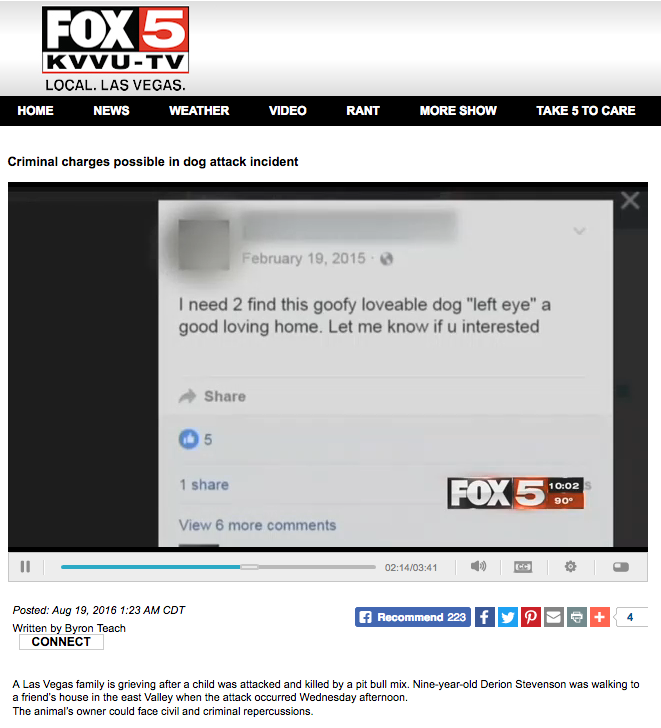 In a painfully common scenario shared by owners of dangerous dogs -- shuffling these dogs around to new owners -- the Las Vegas Review-Journal also reports that Left Eye's owner cited in the July attack (a man) is not the same person who had custody over the dog when it killed Derion Stevenson (a woman). Fox 5 already uncovered the ladder owner tried to give her problematic pit bull away in February 2015. Back then she advertised the pit bull as "goofy" and "loveable." Clark County also admitted that as of August 17 this year, only 2.5% (5) of the dogs involved in dog-on-dog attacks (196) were given a dangerous designation; none were given a vicious designation. That leaves 191 dog owners so far this year who may have lost faith in a system they formerly believed was created to protect innocent people and pets from dangerous dogs. They had to learn the hard way that these dogs and their owners have more rights then they do. The Clark County coroner's office said 9-year old Derion Stevenson died from blunt force injuries to the neck and head from the dog attack. The manner of death was ruled an accident. Derion was killed by a pit bull-mix while visiting a friend's home Wednesday. The dog, named Left Eye, has since been euthanized. Jesse Roybal, a spokesman for the Metropolitan Police Department, said that Derion was with his friends when the pit bull fatally attacked him in the face and neck. Fox 5 Las Vegas reports the dog had a history of aggression. Neighbors told Fox that about 3-weeks ago, the same pit bull, named Left Eye, attacked a different child and also a dog. Neighbor Maritza Cardona said she heard people screaming outside, as people tried to separate the pit bull from a little dog. It is unknown if the attack 3-weeks ago was reported to authorities. As of today, news groups also specified the location of the attack: 6490 Duck Hill Springs Drive. Emerging details about Derion's death include that he and some friends went to the pit bull owner's home "to get some candy," according to relatives. When the front door opened, the dog immediatley attacked his face. "I'm seeing my nephew's face full of blood," said Alikish Moore, the victim's uncle. Moore discovered Derion in a pool of blood unresponsive. First responders rushed the boy to Sunrise Hospital and Medical Center with life-threatening injuries, where he died. The Fox 5 video was updated at 1:23 am CDT to include more information. The victim in the attack 3-weeks ago, who was not identified, said they filed a police report after Left Eye attacked their child and dog. Cardona (mentioned earlier) only witnessed the incident. 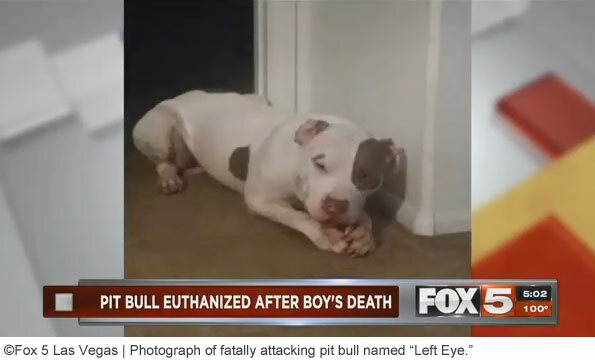 Fox 5 located the pit bull's female owner on Facebook and found a post last year showing she had tried to get rid of Left Eye in February 2015. Police only confirmed they were called out about the dog this past January. The 9-year old boy mauled to death by a pit bull in Las Vega has been identified as Derion Stevenson. The dog was euthanized earlier today, The Associated Press reports. Very little other information has been released thus far. On Wednesday, Derion was visiting the dog owner's home on Duck Hill Springs Drive when the pit bull exited the house and attacked him. Derion was taken to Sunrise Hospital and Medical Center with life-threatening injuries, where he later died. Derion Stevenson is the 205th child mauled to death by a pit bull since 1980, when the pit bull problem began to emerge. Derion is also the 154th child killed by a pit bull since the CDC stopped tracking breed data 18-years ago. 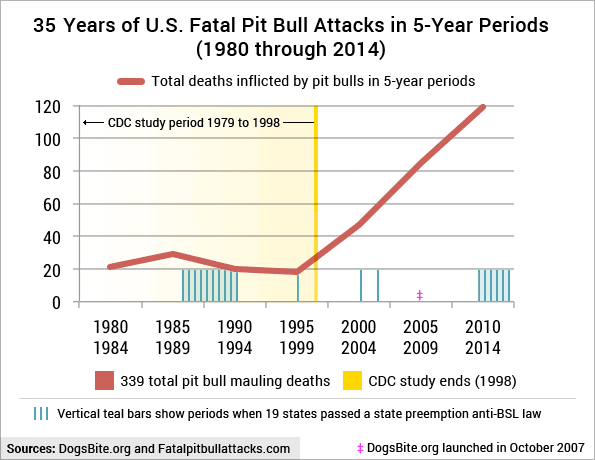 It is not unexpected that pit bull mauling deaths have persisted since 1998. What is shocking is the sharp escalation of these deaths. The rate of pit bulls killing people has increased over 500% since the CDC's study when comparing a recent 5-year period. Las Vegas, NV - A child was fatally attacked by a pit bull while visiting the dog owner's home in East Valley on Wednesday afternoon. Police responded to a home in the 6000 block of Duck Hill Springs Drive, near Desert Inn Road about 3:35 pm, Metro Lt. Timothy Hatchett said. The child was visiting a friend's home when the dog exited the house and attacked the child, Hatchett said. The child was transported to Sunrise Hospital and Medical Center where he died of his injuries. Since 2005, there have been seven fatal dog attacks in Nevada. Four of these attacks occurred in Clark County. Pit bulls were responsible for 71% (5) of the total deaths and include Cenedi Carey, 4-months old, North Las Vegas (2008), Alexander Adams, 2-years old, Las Vegas (2008), Kevin Latz, 50-years old, Reno (2012) and Kenneth Ford, 79-years old, Pahrump (2015). In 2013, Nevada legislators passed a preemption bill barring local governments from regulating pit bulls. In the 11-year period of 2005 to 2015 canines killed 360 people in this country. Nearly 30% (99) of these victims were either visiting or living temporarily with the dog's owner when the fatal attack occurred. Children make up the majority of these deaths, accounting for 71% (70). So far in 2016, 55% of all fatal dog attack victims fall within the "visiting the owner" attack scenario. For years, DogsBite.org has emphasized this dangerous trend in our annual U.S. dog bite fatality statistics. 1Selective breeding for aggression (fighting dogs) runs the whole gamut of aggression. There are countless pit bulls that have seriously injured, maimed or killed a person that first expressed animal aggression. Despite the county claiming otherwise, the July 11 incident must have been a scary close call, otherwise the labrador's owner would not have reported it. Dog owners report attacks like this not because they avoided what "could have been" a horrible attack, but because they are trying to PREVENT a future attack by a dog that scared the daylights out of them. Next step: Lawsuit against the dog owners. Call it BSL, breed specific litigation. Animal Control needs to be included in this BSL. And I hope that the plaintiffs win. What kind of a county would let a fighting breed attack TWO times and do nothing? Animal control paved the way to this death. If only the family of the first attacked child had sued the dog's owner and property owner, and had insisted that charges go forward and sworn out a complaint. This deceased child would be alive today. Why do people do nothing when their children or pets are attacked? Why do I have a feeling that the authorities of this county will just shrug their shoulders, and then forget this child and act like this never happened? Our cities and counties have turned into dog fighting pits. People need to raise hell! The authorities don't do anything. When my collie was attacked by a neighbours German shepherd I reported it to the police. I also got bitten during the attack. The owner of the shepherd told the police my own dog bit me and that my dog started the fight, and nothing was done about her dog. While I was speaking to the police they were helpful at first, until they found out I was walking my dog at the time of the attack – then they basically said "oh it was trying to attack your dog? Then it's not a dangerous dog." – they don't take attacks on pets seriously, not even attacks on humans if you had a pet present. The same dog had nearly killed another neighbours dog (tiny little lhasa apso) about 6 months prior which had been reported, when I asked the police if any other reports had been made about the same dog they told me "none" – a lie. A lot of covering up going on – in that case because the dog was an ex police dog and the owner was the widow of a policeman. I also don't trust police dogs anymore. I used to think they'd only be aggressive on command, now I know better. Pit bull MIX? Oh ok, pit bull mixed with pit bull. Seriously — we nearly commented on this "growing" absurdity. Had their been another photo, we might have. Obviously, the "pit bull-mix" description came from Clark County animal control, no doubt to lessen the blow to the breed. Mix (doubtful) or not, the pit bull is very apparent. The deaths by dog have been overwhelming lately! Just check out what's been happening the UK as well. 🙁 All of the dogs have been pit bull-type dogs (with the exception of today's attack by the Rottweiler/Chow/Shepherd mixes). To me they look more like Rotty pit mixes.